Jimmy Webb, the legendary songwriter and storyteller is accompanied by guitar and string quartet on some of the world’s favorite songs: “Up, Up, and Away,” “Mac Arthur Park,” ” Didn’t We,” “The Worse that Could Happen” and more. In honor of the man they each cherished, Webb is joined on stage by special guest Ashley Campbell, daughter of Glen Campbell. 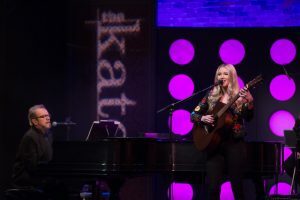 The two perform an emotional set of Webb classics made famous by Glen Campbell like “Wichita Lineman,” “By the Time I Get to Phoenix,” “Galveston,” and “Highwayman.” Ashley is a rising star in country music who inherited her father’s vocal range and musicianship. Jimmy Webb’s complete episode begins streaming on thekate.tv and airing nationally on public television Saturday, May 5th. Go to pbs.org for local broadcast information.